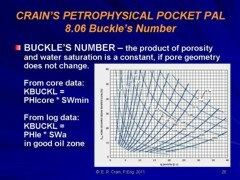 When no porosity data is available, saturation can be obtained by comparing the shallow and deep resistivity logs. This formula is not shale corrected. See below for a graphical solution to this formula. The method is a last resort to be used when no porosity log is available. If there is a nearby water zone AND it has the same porosity as the pay zone, the Rmf/Rw ratio can be estimated from the Rxo/Rt ratio in the water zone, and used in equation 1 or 2, thus exact knowledge of Rw is not required.